Well, if you didn't hear about this today (or listen to a clip of it on your favorite radio show), Anderson Cooper cracked himself up yesterday. His laugh? Well it was funny itself, and is why it's getting so much press. As a person who has experienced the uncontrollable laugh on occasion, and been embarrassed by the sounds I've made, I can actually appreciate this and I find it rather humorous. I will say, Anderson's need to explain all the puns in his editorial on this idiot who urinated on a plane sort of ruined the flow of his humorous schpeel. But the laugh brought it home. "When a woman's at the wheel, Polyglas means more than mileage." - Goodyear. I find myself sitting home alone tonight, as my wife and her girlfriends go out to dinner. I mean, a woman that works that hard to take care of my boys, my home, and me deserves a night out right? So here's a few things I've been thinking of posting, but never have the time to post. 1. PCSO went Dodge, a new paint job, and a SWEET looking ride. The Placer County Sheriff's Office has begun updating their fleet with the next generation patrol vehicle. 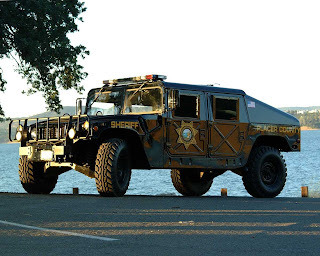 Since Ford is discontinuing old faithful (the Crown Victoria/Police Interceptor), Placer went with the rear wheel drive alternative available. This picture is of a 2011 Dodge Charger, and although Placer won an award for their previous paint scheme in the 90's, this one has been refreshed and renewed. I love this new car's look. A softer sound from Jack. 3. Gungor is working on their new album. Here's their sneak peak and an explanation of the bands evolution into this next work (Oh man, I just used the word evolution on my own, and then I just heard them say it in this video). In case you didn't see it before, this is the album that I first heard at Bridgeway Christian Church in Rocklin, and it's what started my love of this bands music. 4. I got a free cup of coffee yesterday. That is all. I mean...it's sort of obvious...and it was there.